In Osaka on sunny and warm Sunday, October 8th, 2017, more than 250 Aikidoka – both adult and children – from around Japan as well as overseas, gathered in the municipal gymnasium to celebrate the 50 years that have passed since the birth of Honbu dojo. 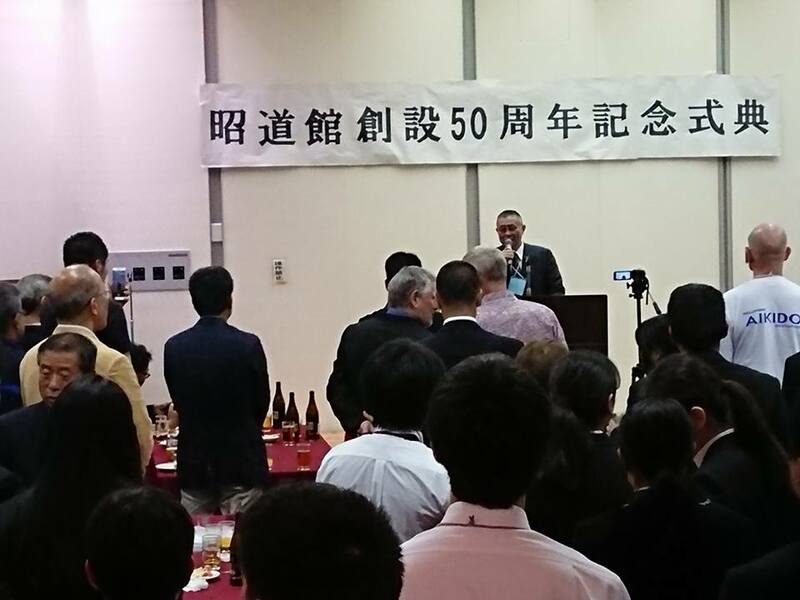 Yes folks, 50 years ago Tomiki Shihan established Shodokan honbu dojo in the city of Osaka, Japan. It was indeed a day of celebration. 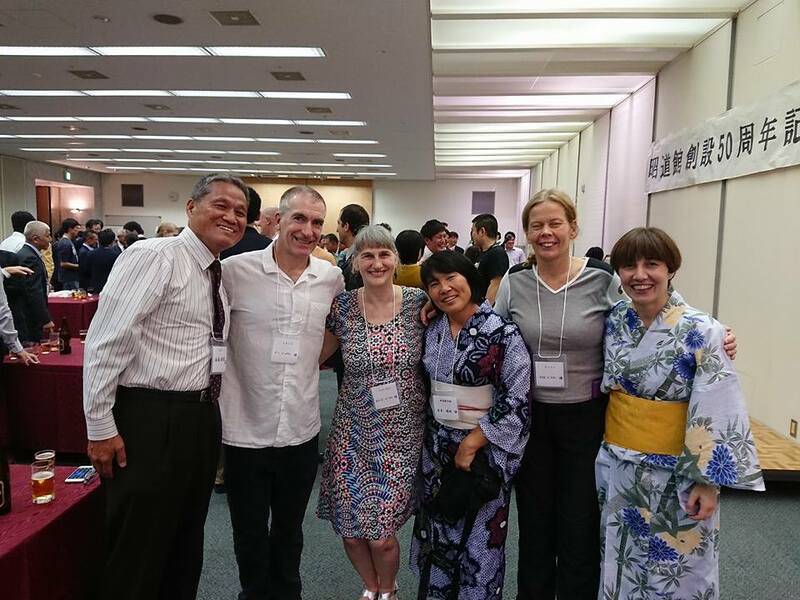 The festivities kicked off at 9:30 am with an hour-long seminar taught by Nariyama Shihan. The theme of this workshop was ki-hon practice along with application or Oyo. 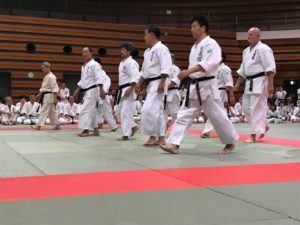 The techniques chosen to focus on were the first three techniques of atemi waza and oshitaoshi from hiji waza. After around forty-five minutes of practice, everyone lined up and did atemi waza’s hontai no tsukuri. Following this training session was a short break, then elementary school and junior/senior high school students from various Shodokan clubs in and around Osaka performed multiple demonstrations. Club instructors demonstrated their teaching skills on the different “courts.” Lunchtime soon arrived, and after the break, adult aikidoka showed their own sets of free waza. Each of the five prepared competition courts had teams of pairs who gave displays of different techniques. 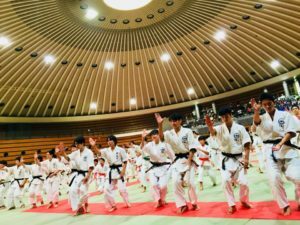 At around 14:30 male university students, under the instruction of Sakai sensei, demonstrated Hijimoji no tsukuri and Kaishiwaza. It was a fantastic spectacle to watch as more than fifty pairs moved in unison across the entire tatami area. 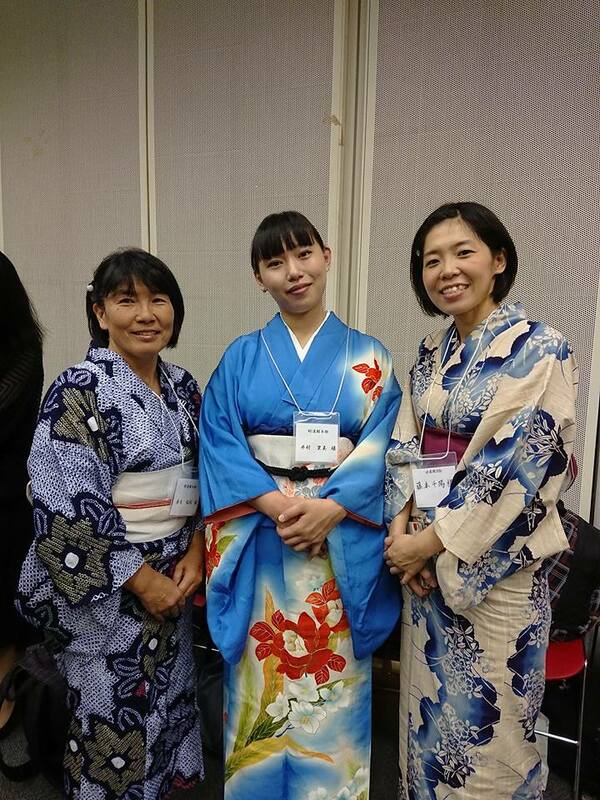 This event was followed by university student women, performing suwari waza. 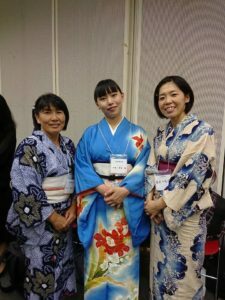 The girls were all wearing hakama. The next event of the day were demonstrations from Shodokan’s elite. Morikawa sensei, Teranishi sensei, Yamagata sensei, Nishi sensei, Endo sensei, and Omori sensei along with their ukes’ put on displays of Aikido from Goshin no kata to Oyo waza. A proverbial feast for Aikidoka eyes. The final demonstration of the day was, of course, Nariyama Shihan’s contribution. Using Joe Adams and Sakai sensei as ukes, Shihan didn’t fail to please. Although he is soon to be 70 years old, he still showed us that we all have a long way to go before we can attain his level of understanding and ability. Sakai sensei also gave us a taste of his excellent skills when he and Joe Adams performed Nagi no kata. Both Tori and Uke were superb. At 16:30 the final display of Shodokan Aikido was the Kongo dantaisen (spelling). 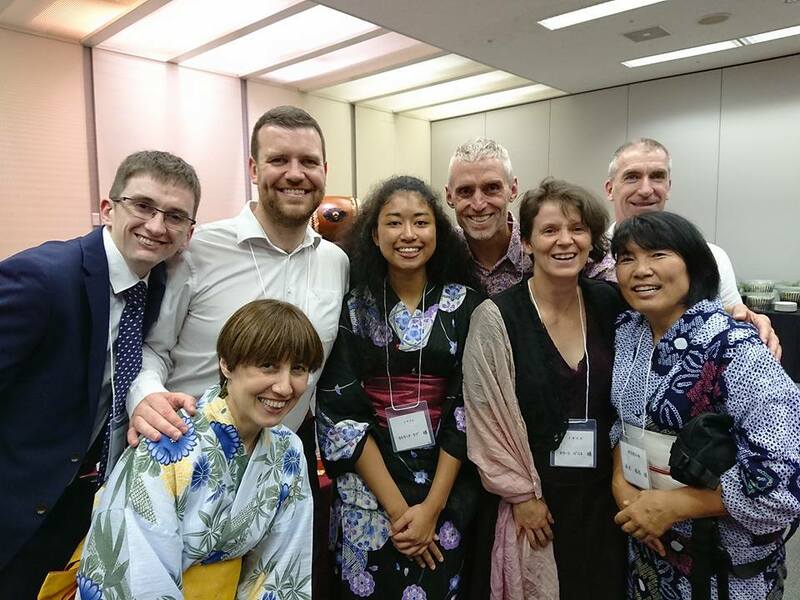 Two teams demonstrated the different aspects of Shodokan Aikido – Goshin no kata, tanto taisabaki, toshu randori and finally tanto randori. With the day’s sporting activities over, it was time to party. In one of the municipal gymnasium’s conference rooms, beer flowed like amber-colored water from a broken fountain, hungry guests chowed down on various kinds cuisine, and raucous banter filled the room. 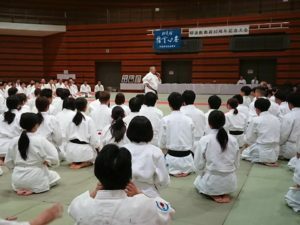 There were, of course, the speeches with the final few words from Nariyama Shihan. 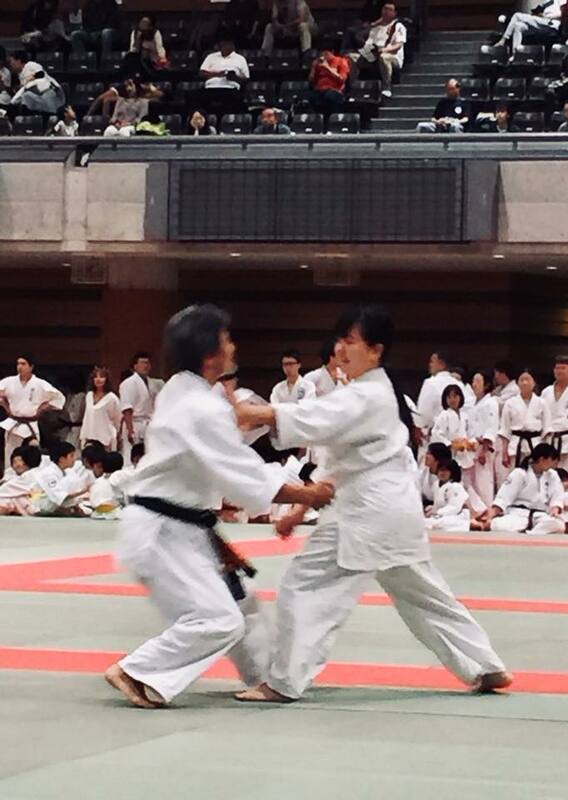 Nishi sensei practices with his daughter.